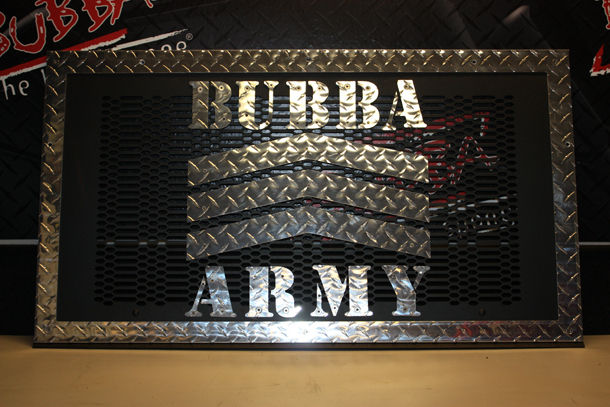 Doc from Dragon Tail Customs (Sarasota, FL) stopped by the studio with the new Bubba Army Grill that will be placed on the Cream Machine. Thanks Doc! looks cool now if i can just get the 2 bubba license plates i ordered back on february 22nd and credit card was billed february 25th and i emailed 25cent 8 times about (both his email addresses listed on the site) and emailed bubba as well and got zero response!!!! life would be grand! Haven’t turned a single wrench on the ” protein machine” now have ya’ there chubby bunz’?? Maybe if someone pump sprayed gravy on the “I cant make a woman scream” machine, you mite’ take more interest than just flippin’ out the cash for it. Tubby!!!! !